Congratulations. You've made it to Paris. You have a few things on your list that you absolutely want to do or to see. I bet a visit of the Louvre is at the top of it. And you are absolutely right. 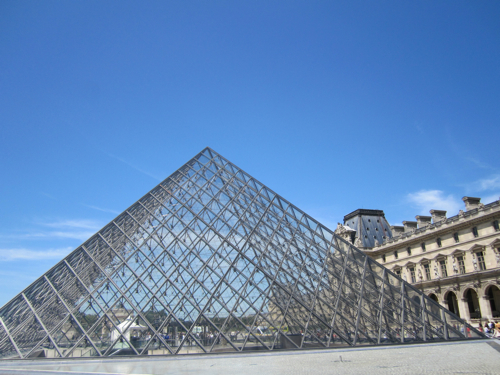 The Louvre is a must, indeed, a city within a city. Not only because of its incredible collection of 35 000 works of art and artefacts, among them the most beautiful masterpieces of Western culture. The architecture and the interiors are breathtaking too. Prepare yourself because you will not be alone! 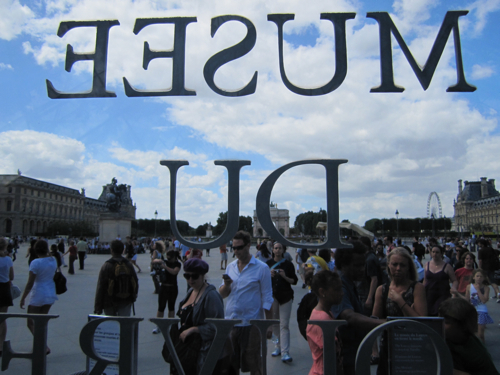 To tell you the truth: every year 8 400 000 visit the Louvre. You do not need to be a mathematician to calculate that, on an average day, 23 000 people will be in there with you. They queue for approximately – I hope you're sitting comfortably as you read this - 107 minutes. But do not worry. You do not need to queue at all if you listen to “Mad about Paris”. There a only a few things to bear in mind and your visit will be an amazing experience. First of all: Never go on national holidays, never on the first Sundays of a month (when the entrance is free) and avoid the slot between 10 and 1 am when everybody else has nothing better to do than visit the number one tourist spot of Paris. Instead, take advantage of the “nocturne”, the late opening on Wednesday and Friday nights when the museum is open until 10 pm. You might not believe it, but on a Friday night, when “tout Paris” is dining out and most of the tourists have already collapsed after a long day of walks and visits, you will have some galleries all to yourself. Not the Salle de La Joconde, of course. 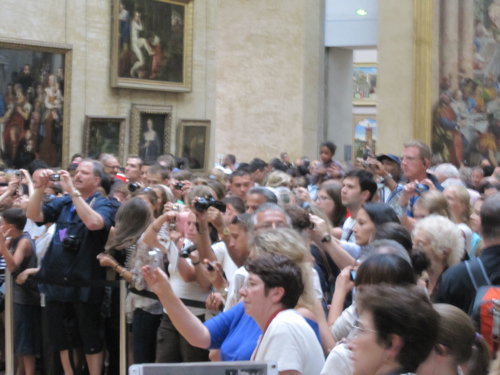 Everybody who goes into the Louvre comes to see her: the Mona Lisa. That’s why an intelligent museum director put her in a new, a special gallery to spare the visitors long detours. 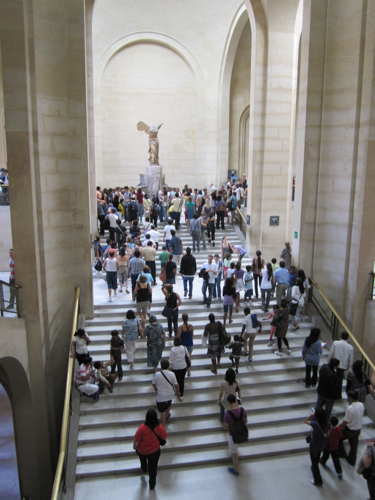 On their way to the Mona Lisa they will happen across The Winged Victory of Samothrace. Is that by chance? Not at all, it’s on purpose, of course. They want to give you the impression that you have seen all the masterpieces in half an hour – and encourage you to quickly quit the battlefield. Honestly, standing in front of the Mona Lisa feels like waiting on a New York subway platform at rush hour (except less people take photos there). So ask yourself before you go: Do you really want to see this tiny little painting? Do you need to see her, even if her smile will lose some of its charm behind all those cameras and cell phones? Maybe you are just fascinated by her success, so you’ll have a glance and than head on further. Still, you should know that the whole Denon wing with Italian Renaissance painting will be crowded. And for good reason: Botticelli, Fra Angelico and Lippi, Piero della Francesca and Leonardo da Vinci, they are all there. But strangely there are no crowds in front of Leonardo’s Virgin and Child with Saint Anne. Is the painting any less beautiful? Not exactly. But the VIP-factor is just not as high. And nobody really seems to care about the Titians just hanging on the back of the stand-alone wall, behind theMona Lisa. You definitely do not need not to tread on other people’s toes for visiting the Louvre for one simple reason: it’s the world’s largest museum. 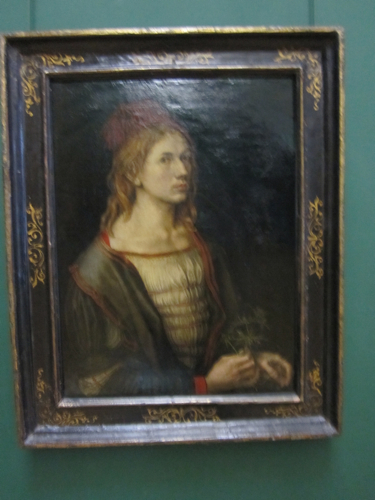 The same day I took the photos of the Mona Lisa under siege, I was all by myself in front of a self-portrait by Albrecht Durer. Almost noone was admiring the mystical paintings by Georges de La Tour. Ancient Egypt doesn’t interest a lot of people either. That’s why you absolutely must prepare for your visit. The Louvre website is amazing and very helpful. Have a look at it and decide before coming to Paris what you do want to see. Don't try to go any more than one or two sections because, as is often the case, less is more. To avoid disappointment, check on the website to see if they are open the day your plan to visit because some galleries are closed on different days. And remember: The Louvre is closed on Tuesdays! Before I forget: if you don't like queuing for up 107 minutes, why don’t you go in by the hidden entrance called Porte des Lions, on the side of the Seine? On a busy afternoon in July, I could just walk through there at Porte de Lions, whereas the same day I would have spent at least20 minutes queuing up for a security check under the glass pyramid. Because even if you buy advanced tickets online, which you can do, of course, you will have to queue up for a security check. France seems to be well organized and they make queue people in two lines (one for groups, one for individual visitors) just to make the two lines converge into one a bit further on. One last thing: forget the glass pyramid. It’s gorgeous to look at. But never waste you time queuing up there only for them to check your bags! Have a coffee in Café Marly instead. And use it, majestically, as an exit.